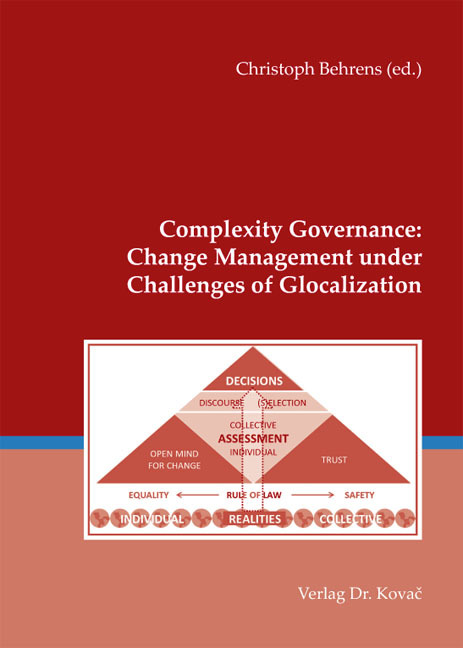 Complexity Governance: Change Management under Challenges of Glocalization. Forschungsarbeit von Christoph Behrens (ed. ), Verlag Dr. Kovač 2013, 180 S.
Growing complexity due to globalization, migration, increasing speed of developments and other factors is ubiquitous. As a result, a lack of governability has become a global phenomenon. Based on experiences within a long term governance reform project in Indonesia, the interdisciplinary and international team of the Center for Good Governance has developed a model for complexity governance which is outlined in this volume. Applied exemplarically in several key policy fields such as civil service reform and green economy, the model shall contribute to fill the gap between the need to govern and the lack of available practical approaches. It thus shall lead to a stronger democratic culture, particularly to contemporary concepts of leadership for a sustainable democratic development in Indonesia and beyond.